Bacteria AKA GERMS, are everywhere. They are on our skin, in the soil, the grass our shoes and even our socks. The difference between colonization (bacteria living with you) versus infection is sheer number as well as your body’s response to that number. This summer, hygiene for your feet is key. 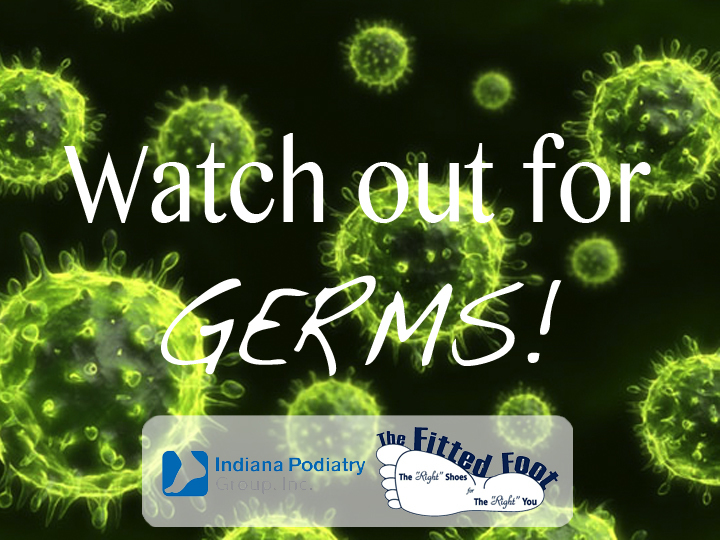 Your feet and footwear are some of the biggest transporters of bacteria. Eliminate the environment bacterial loves to grown in. What is that? Dark, warm and damp environments are excellent for your bacterial, fungal and viral gardens; vegetation that can infect your feet and nails. It is very important to clean your shoes after traveling through public areas. Shoe cleaning, along with frequent vacuuming and mopping can help eliminate more than 90% of germs. Additionally, practice good foot hygiene by washing with antibacterial and/or anti-fungal soaps. Keep feet dry with wicking socks or change cotton socks frequently.